This is a fairly quick and simple post that’s really just here to complement a few other dishes. 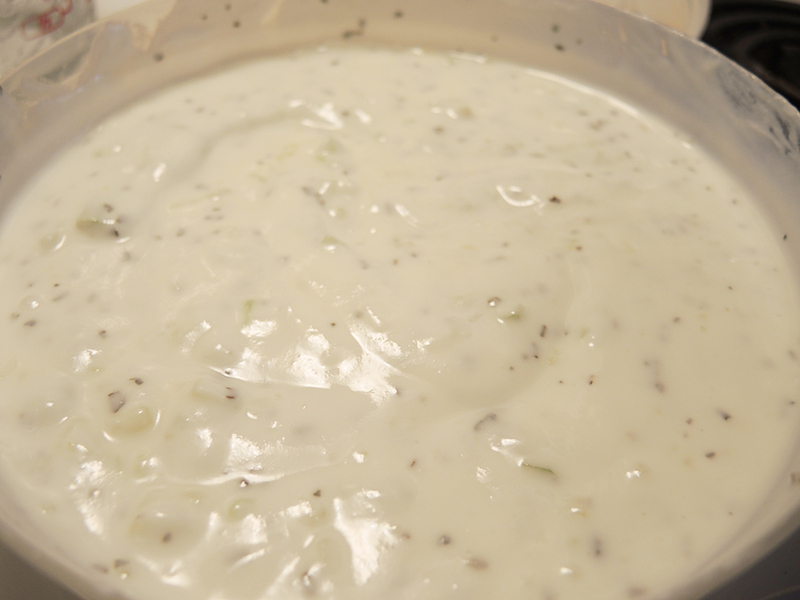 More specifically this savory yogurt sauce goes extremely well with grilled lamb, chicken, grape leaves, homemade gyros, and salads. 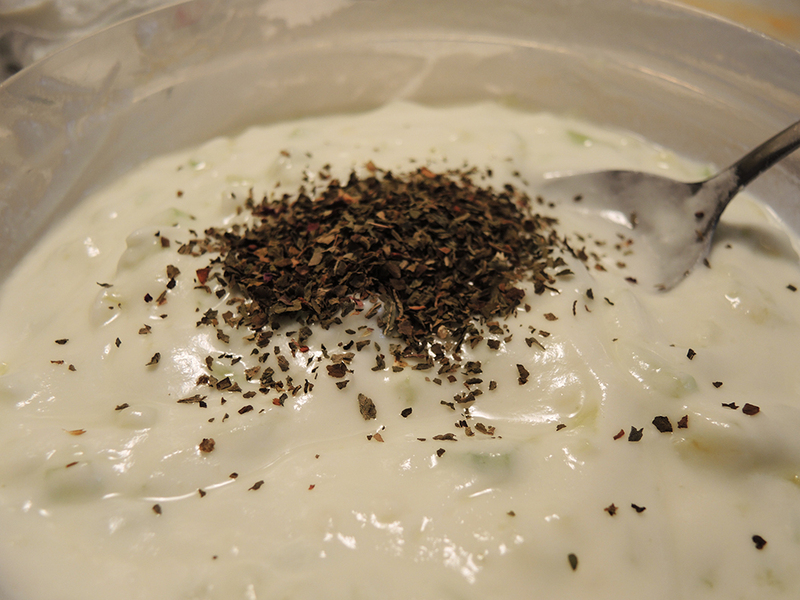 There are a lot of different ways to make this cucumber yogurt or Greek tzatziki-like sauce/dressing/dip. The few truths I’ve learned over the years when it comes to making this delicious food topping is that the keys are avoiding going too chunky with the cucumber and getting too heavy handed with the garlic. 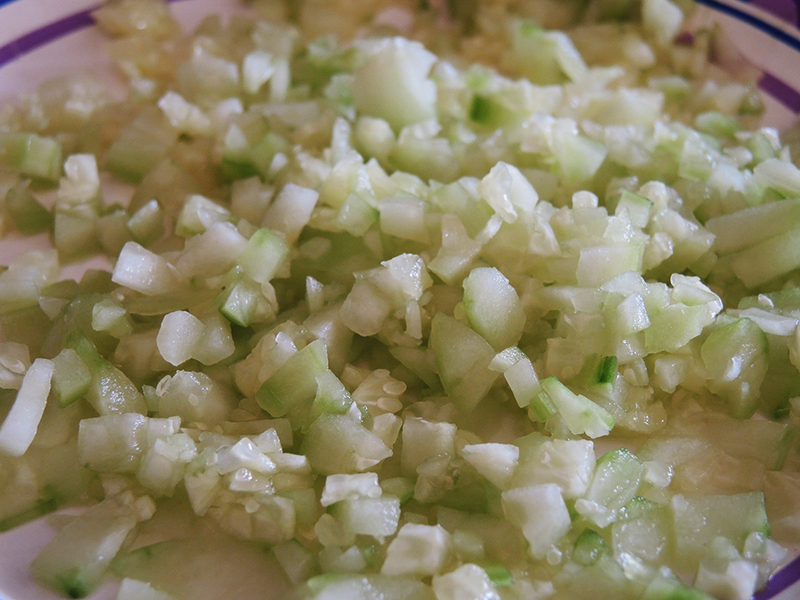 Chunky cucumber means the sauce doesn’t act like a topping, but instead acts like a salad. Too much garlic will overpower the subtle sauce and not only burn a bit, but leave a lasting garlic taste in your mouth long after you’re done eating it. Coincidentally, you can make this sauce using only yogurt, salt, and garlic, but the cucumber and herbs go a long way to making it that much more light and refreshing. Enjoy this very simple recipe along with other wonderful Middle Eastern, Greek, and Mediterranean dishes. Makes about 2 to 2.25 cups at 316 calories total or about 10 calories per tablespoon. 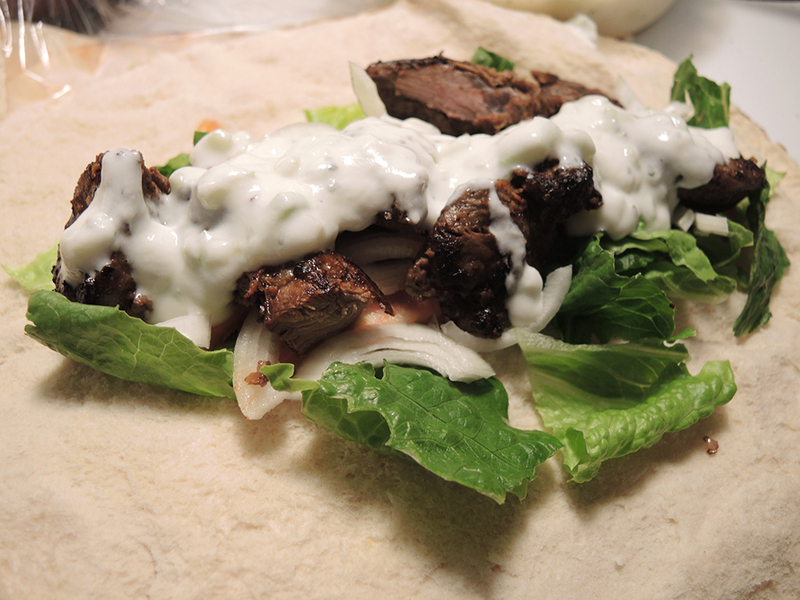 Tzatziki sauce with yogurt, cucumber, mint, and garlic. 2 cups whole fat plain yogurt (about 300 calories) Note: You can also use Greek yogurt for authenticity or nonfat yogurt (about 200 cal. ), but you won’t get as much rich flavor from nonfat yogurt. 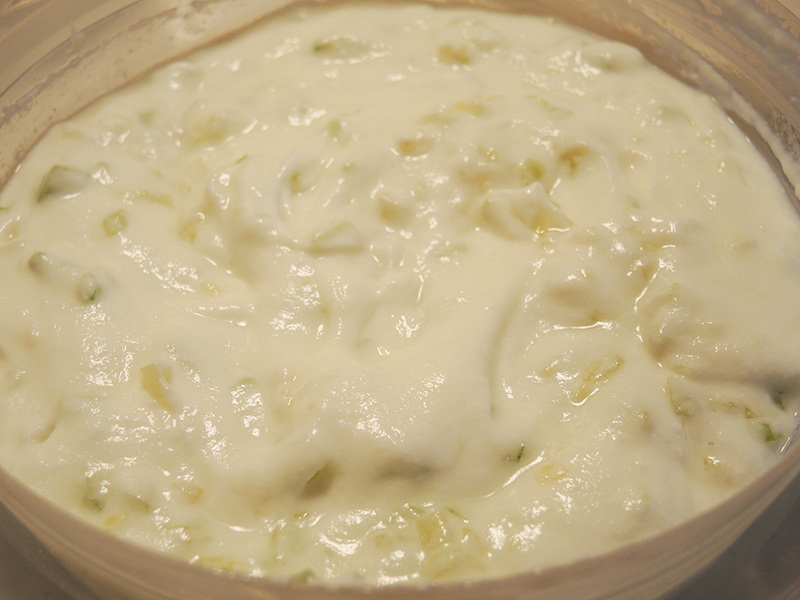 If you only have nonfat plain yogurt, you can also add a tablespoon of whole fat sour cream to enrich the sauce/dip. 1/2 or 3/4 teaspoon of dried, crushed, mint or basil leaves Note: Mint is best, but basil will work in a pinch. 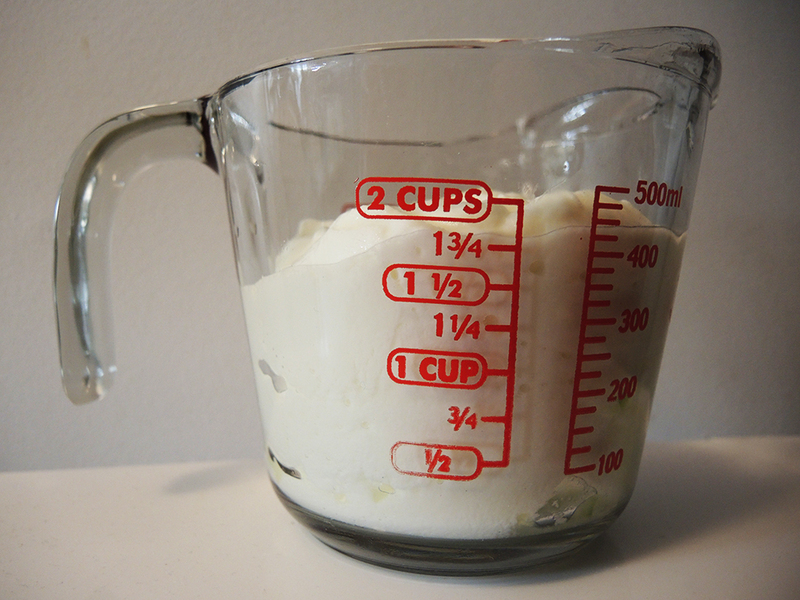 Measure out 2 cups of plain yogurt and dump it into a bowl or container. Cut an average size cucumber in half, peel, and finely dice it up. If you want to remove the seeds, then cut the half cucumber in half again lengthwise and run the edge of a spoon down along the seeds to scoop them out. Add the cucumber into the yogurt and mix thoroughly. Add the crushed garlic clove, mint (or basil), and salt to the yogurt and mix thoroughly. If you like it garlicky, use 2 cloves. If you prefer it a little milder, then just use one clove. Let the ingredients sit covered in the fridge for about 30 minutes to an hour so that all of the flavors incorporate. Growing your own cucumbers is a wonderful idea and this is a wonderful use for them! Please let me know how it turns out! Tzatziki usually gives me heartburn, (unless i’m eating it in Greece… must be something in the air 😉 ), but I think i’m going to give this a try. Didn’t realize how simple the recipe was! My boyfriend (who is half Greek), will definitely appreciate it… will let you know how it goes! Heartburn, huh? If that’s the case, you might want to try this with a nonfat yogurt. It won’t taste as rich, but without the fat in the yogurt, you might not get the heartburn because it won’t stay in your stomach as long. On the other hand if you’re eating the sauce with fatty foods as well, then it could be a moot point. Let me know either way! I’d love to get feedback on the recipe! I love tzatziki. It’s one of my favourite ever sauces to make at home… my version is pretty similar to yours with the sour cream, but I use mint instead of basil. I even eat it with very non-Mediterranean things (for example, spread on ham sandwiches with tomatoes!). I can’t wait for your vine leaf recipe. I’ve never made vine/grape leaves at home (do you mean dolmades?) but I’ve always wanted to. Thanks for your version! Would it still be okay if I reduced the amount of yogurt? too much yogurt makes me bloat. Thanks for sharing!!! You could reduce the yogurt, but then it’ll be less like a sauce and more like a cucumber salad. I would recommend just using less of the sauce when you put it on something rather than lessening the yogurt for the whole recipe. But do whatever tastes good! I can’t be sure what you used but your cucumber should look like this for Greek style Tzatziki. I’m not sure how easy they are to come by outside of Cyprus and Greece though. These are tiny have a curvature to them and are full of flavour and natural colour. The type in your picture appear very pale so I assume they are not the same. The difference is huge. Thanks Marious for the recommendation. We do actually have those cucumbers and I use them sometimes for various things because they are tasty. I also use English cucumbers on occasion because they have small seeds that are easy to get rid of. The “paleness” in the cucumbers above is simply because they’re peeled ahead of time, so there’s no green skin. Thanks for sharing and reading. Please stop by again!